There's a fascinating interview with Ursula K. Le Guin over at Electric Literature. She talks about the former literary/genre divide, and when to ignore "the rules." And she also explains why creating radically different versions of gender is actually a way to help people see the here and now more clearly. 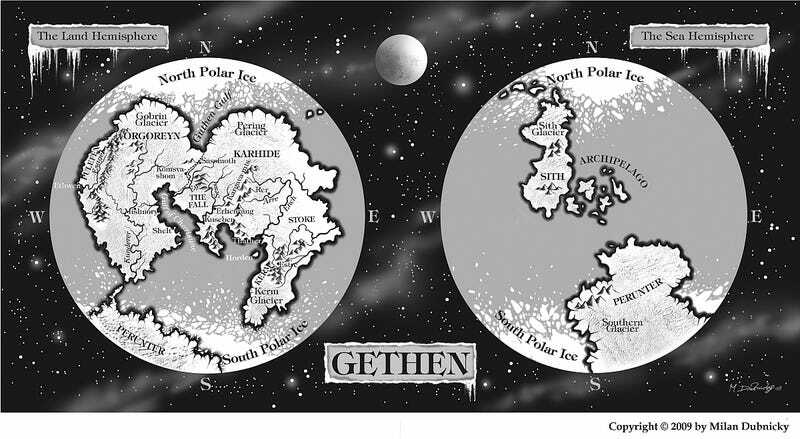 Top image: Map of Gethen by Milan Dubnicky, from the Czech edition of The Left Hand of Darkness. MC: It's been written of Samuel R. Delany's work that, "By imagining a new gender and resultant sexual orientation, the story allows readers to reflect on the real world while maintaining an estranging distance." The story in question was, "Aye, and Gomorrah," but it could be said of other work by Delany, and certainly of some of your own work, very much including The Left Hand of Darkness. You needn't focus specifically on the advantages of claiming the right, in fiction, to re-imagine genders, though that would of course be interesting. You could also talk a bit, if you like, about other freedoms offered when a writer releases herself/himself from what I suppose I'll call the "natural" world—that is, from the planet Earth, its denizens and conventions. UKLG: I think Delaney was using Darko Suvin's very useful concept of "cognitive estrangement" for what is perhaps the characteristic gesture of science fiction: Giving the reader a new place from which to look at the old world. Or, as Suvin said, a mirror in which you can see the back of your own head. Stendhal, that dour realist, boasted that his novels were "a mirror at the side of the road" reflecting reality. But such a mirror can't show you the world or yourself from a viewpoint you never saw it from before, as science fiction does. The thing to remember, however exotic or futuristic or alien the mirror seems, is that you are in fact looking at your world and yourself. Serious science fiction is just as much about the real world and human beings as realistic novels are. (Sometimes more so, I think when faced with yet another dreary story about a dysfunctional upper middle class East Coast urban family.) After all, the imagination can only take apart reality and recombine it. We aren't God, our word isn't the world. But our minds can learn a lot about the world by playing with it, and the imagination finds an infinite playing field in fiction. Serious science fiction is just as much about the real world and human beings as realistic novels are. Along in the sixties it became important to a lot of us, especially women and gays, to try to get a better idea what exactly "gender" consisted of. "Him Tarzan, Me Jane" no longer seemed quite adequate. The science-fiction mirror offered itself to me (and Theodore Sturgeon, and Samuel R. Delaney, Vonda McIntyre, Joanna Russ, and many others) as a great way to get a different angle on the whole thing. Cognitive estrangement can help you develop new cognitions, wider understanding. And that, as you say, offers a writer a desirable freedom. To me, though, it's not a release or escape from our world. My world is all I have to make my stories from, my people are the only people I know. But by making up worlds and peoples, I can recombine and play with what we have and are, can ask what if it were like this instead of like this—What if nobody had a fixed gender, as on the planet Gethen? What if marriages, instead of two people and one couple, consisted of four people and four homo- and heterosexual couples, as they do on the planet O? If nobody in a world had ever waged war, how would people and daily life in that world differ from ours, and in what ways? Much of my science fiction is, in this sense, anthropological. My father was an ethnologist, who learned from the Indians of California that California could be inhabited in a very different way from how we inhabit it—many different ways. I send imaginary people to imaginary planets to learn other ways in which we might inhabit our own. I feel some urgency in obtaining this information, since we're inhabiting our planet in an increasingly destructive and unwise way. The whole interview is well worth reading.